We were all just sitting around the family room, watching a scary show on t.v., when the real thriller happened. My husband's side of the family was staying with us for a few days of vacation, which meant we were a full house. Four brothers, a sister, in-laws, the parents, nephews and nieces...We were like a bed and breakfast. On that particular late afternoon, after everyone got tired from throwing, catching and kicking ball on our front lawn, we all settled in for some relaxed time in front of the television. One of my brothers-in-law (BIL) was massaging the head of my 9-year old niece when he felt a small bump on her scalp. At first he thought it was just another scab on her scalp that she might have scratched from long ago, but as he began to part her hair to take a closer look, he realized it was something else. He exclaimed, "What is THIS??!! ", squinting his eyes while simultaneously trying to get our attention. I was seated quite close to the two of them so I slid even closer to take a look at my niece's head. By this time, it has gotten clear to my BIL that what he was looking at and feeling with his fingers was a living creature. I don't know what made me exclaim, considering I haven't seen one in real life before, but it just came out of my mouth. None of us knew for sure but it was the prime suspect. And whatever it was, we all knew it had to be pulled out. My sister-in-law (my niece's mom) immediately rushed to take a look, while my husband and I sent our son to the upstairs bathroom to grab the tweezers. As soon as the tweezers came, we handed it to my SIL and I recall myself repeating, "Make sure you grab the whole thing; Don't break the head off". (All this I remember from reading a bunch of tick-related articles, since I'm the resident paranoid that everyone always made fun of...until now!). My SIL did her best to pull it straight up but to no avail. This bug's grip on my niece's scalp was remarkably and frighteningly tight! I'm not joking. My husband then took over to try if he could do it. He yanked it hard and we could see that a chunk of my niece's scalp came off with the bug as it lifted off of her head. Whew! Then we rushed to place it on top of a piece of paper towel, had the presence of mind to take pictures from a couple of phones (in case we ever needed to show it to a doctor for identification), before another BIL burned it with his lighter. This is the picture of the actual tick. You can still see a piece of my niece's scalp attached to its mouth part / "front claws". 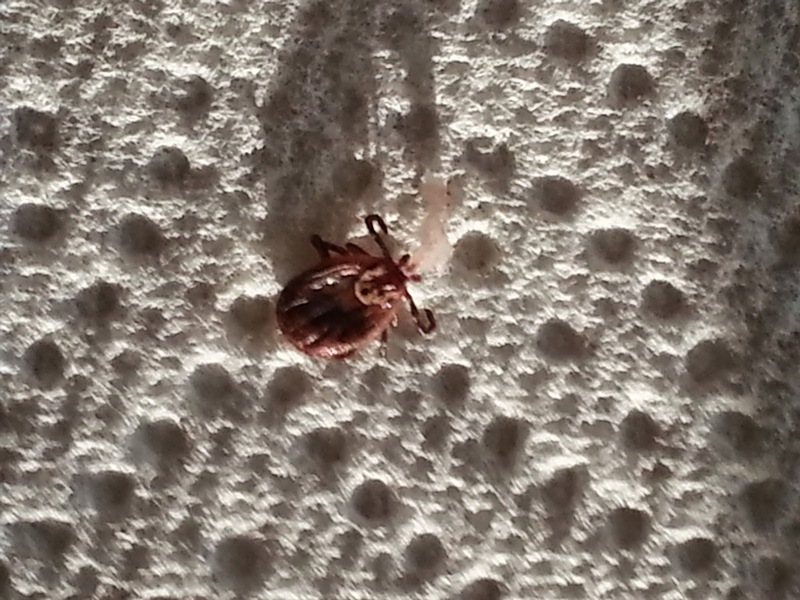 Almost immediately, another SIL searched online to try to identify this tick. After her research and mine, we felt comfortable enough to conclude that this may be the American Dog Tick, and not the Deer Tick which carries Lyme Disease. (Another 'WHEW! ", although, this kind can still cause the Rocky Mountain Spotted Fever, according to the CDC). We looked for various pictures online to use for comparison and found this. They look pretty much the same, don't they? Another thing that gave everyone in the family some sense of comfort was the fact that the tick we found did not seem engorged (did not look like a grape), which meant it probably has not fed yet and therefore might not have yet released its toxins. I also read that normally, a tick takes no less than 24 hours of being attached to its host and feeding before it releases the toxins. I found several sites giving detailed information on ticks, but I found this, this and this to be particularly helpful for quick information. We don't know exactly where my niece might have gotten this tick. We were out almost all morning. She stood on the grassy area of a brunch place we went to. She stood under trees at a donut place we visited. Then she was playing on our lawn that early afternoon. It could have originated anywhere. We simply don't know. Although I suspect it might have fallen on her head from somewhere. This seems more logical than thinking that the tick crawled all the way from her feet and settled on her head without her feeling it, considering it was a fairly large one. But who knows? All I know is that I rushed to wash all our beddings less than an hour after our frightening discovery just to be on the safe side. Oh and note that you'd want to use the hottest setting on both your washer and dryer. It's not the detergent or water that kills these bugs efficiently. It's the heat more than anything else. Check out this article. I also know that I feel vindicated! All this time, I have been made fun of every time I insist that everyone spray themselves with insect repellents. I have felt dismissed, even by my own husband, when I say that we need to be careful stepping on grass because there might be fire ants and ticks and whatever. Yes, I admit, I seem overly neurotic most times, shunning the outdoors. But look what happens when I relax. Well, suffice it to say that at the end of that day, before his bedtime, my husband spent hours online researching the best tick prevention methods for the yard. "Bad things happen when you don't listen to Mommy". Anything that crawls creeps me out, Janine! And yes.....Ewwwww!!! Mummy is always right! Well, I have to say that you are ahead of me, Joy. My daughter has nits, but we have never had ticks just yet. And believe me, getting rid of nits is an ugly business too. Bad things DO happen when you don't listen to Mom. I tell my teenagers that every day. I'm still waiting for the day when they figure out it's true. That's what really scares me, Carol. Eeeekkk!! Yikes! Horrible, nasty, beastly things! My Dad always told us to light a match, blow it out, then hold the hot part to the tick. The heat will make it let go and back away really fast. Never had to try it. Icky. Icky. Ick. Ick. I've heard multiple 'strategies' of dealing with these yucky ones. But I know the consistent one is to try to pull them straight out with a firm motion so that they don't feel threatened and release the toxins into the host. These are crazy, and the scary part is that I'm guessing with climate change, these creatures are multiplying more rapidly and spreading to more areas. So yes...Icky. Icky. Ick!!! Thanks Diane! I've found ticks on myself, my kids, my dog and (most recently) my son's bedroom floor. I can't say I am any less repulsed by them than the first time I saw one though. Your poor niece - how did she react to all the attention?! Are You Defensive About Being A SAHM?